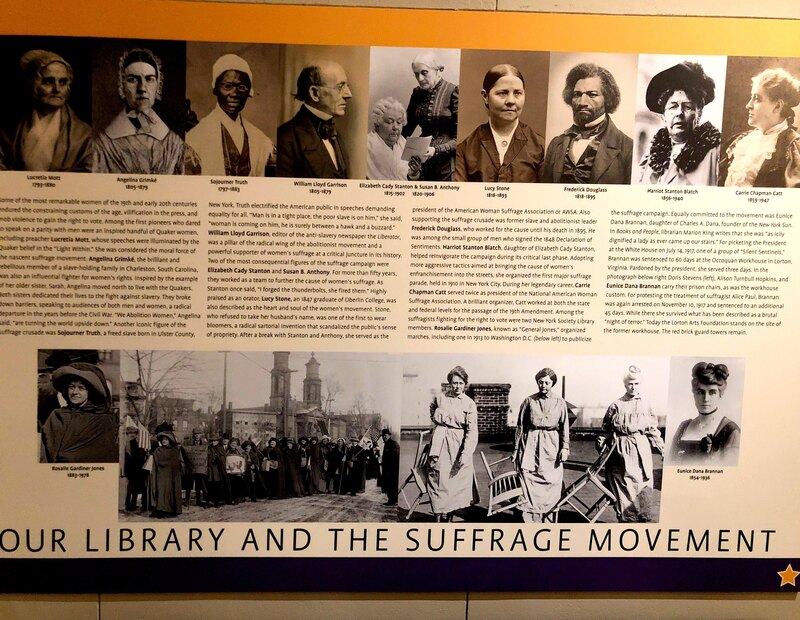 The exhibition is a little jewel, an information-packed delight, curated by Harriet Shapiro and Cathy McGowan with graphics by Doreen Pastore. The Library’s website page for the exhibition is here. And as a teaser, check out this (no-justice-done) iPhone-shot slideshow of the exhibition, which will be on display until August. 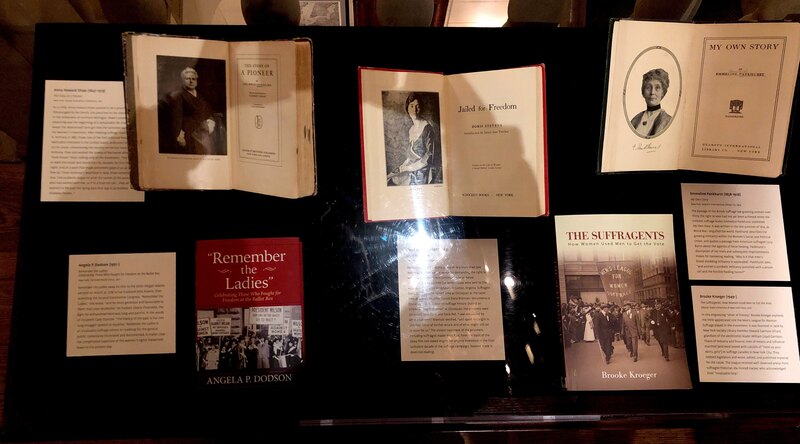 Seeing The Suffragents in one of the display cases along side Angela Dodson’s Remember the Ladies brought back fond recollection of our joint appearance at the library in September 2017, as both of our books launched. 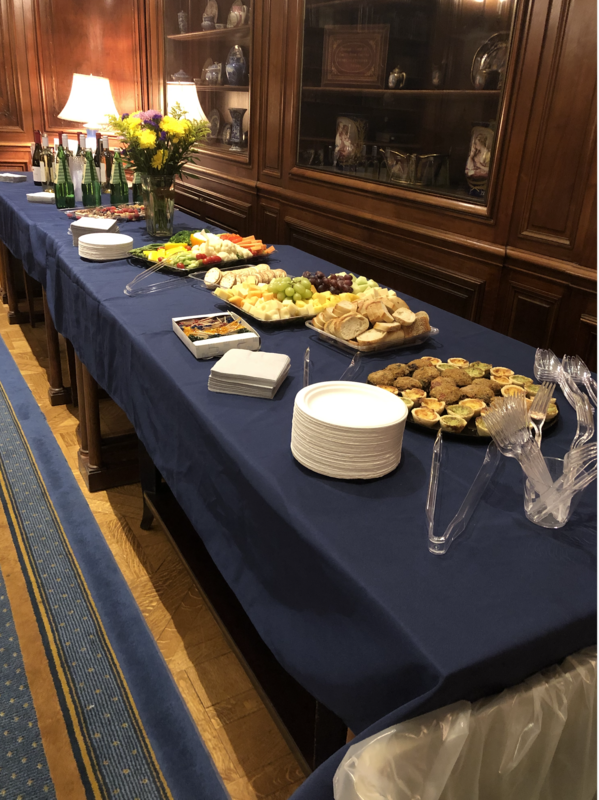 Tuesday night (January 29, 2019), there was a lovely reception for the exhibition opening, at which it was so nice to see friends of long standing who happened to be present: Natalie Naylor, who came to honor one of her research loves, “General” Rosalie Gardiner Jones, who is featured, and Jurate Kazickas, who lent her signed first edition of Susan B. Anthony’s memoir to the exhibition. My buddy Sarah Challinor popped in. too. Thank you, Sarah. Writer/editor trio: Jurate Kazickas, Adrienne Ingrum, and Natalie Naylor, viewing one the exhibition cases. 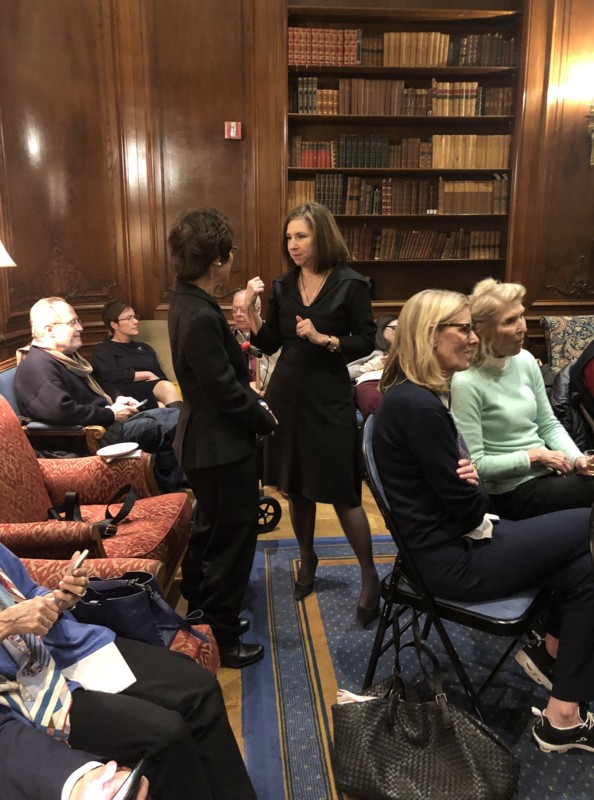 Head librarian Carolyn Waters, my friends Sarah Challinor, and Jurate Kazickas, who lent the Susan B. Anthony first edition to the exhibition. 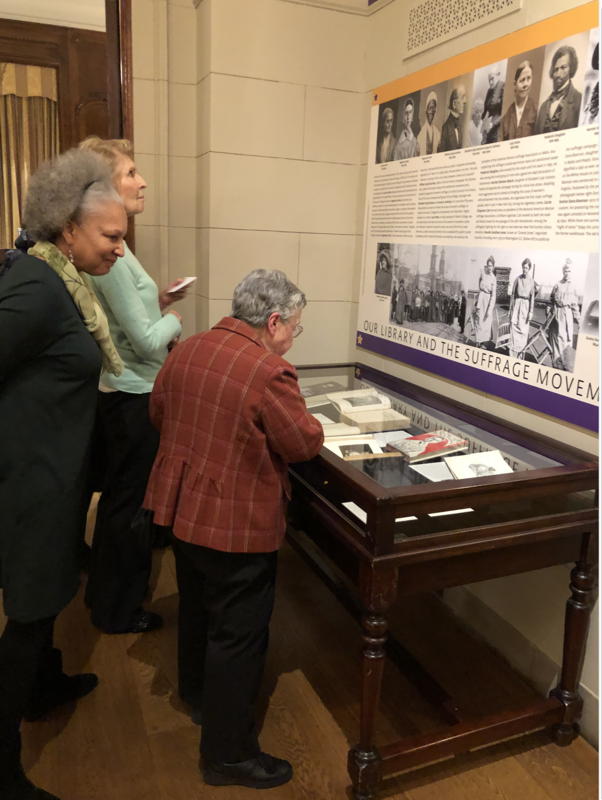 In the room where I spoke was a model of the proposed suffrage state for Central Park. The sculptor is Meredith Bergmann, a library member, who lent it. The scroll is meant to represent the legions of women (and, I have to presume, men) who worked for the cause over what was nearly two centuries. You can read more about it here and about the discussion the commemoration-in-monuments across the country has occasioned here. 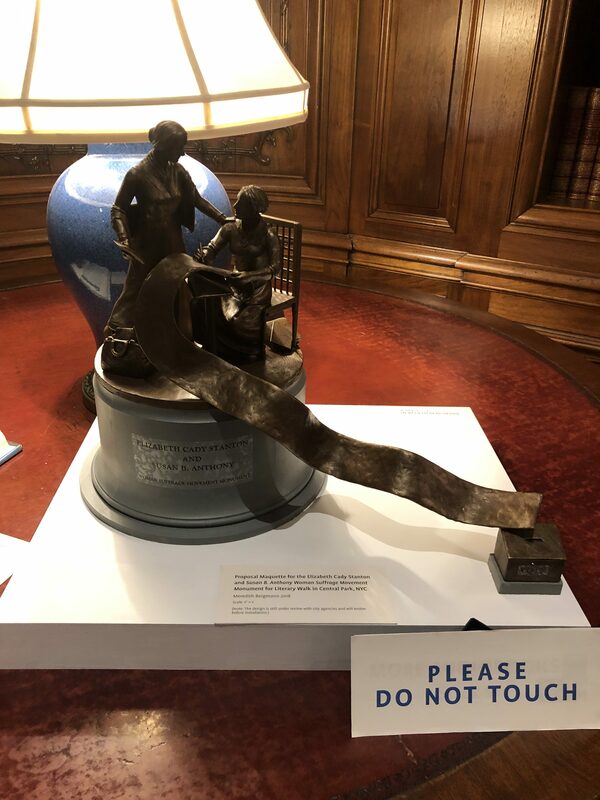 Apropos, New York State has approved new monuments, to honor Rosalie Gardiner Jones and Sojourner Truth. 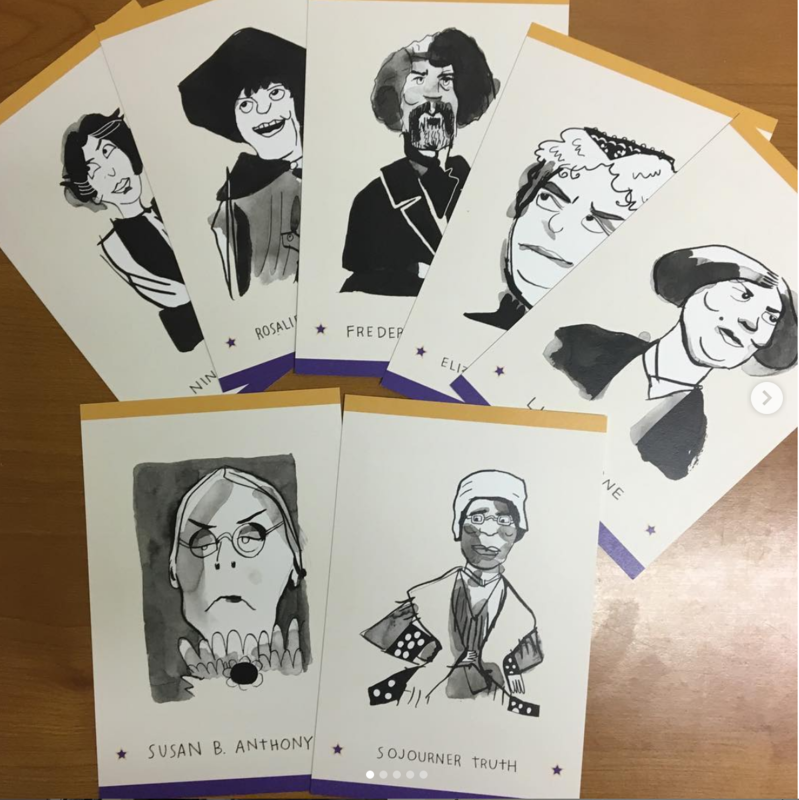 Oh, and the Library is selling for under $2 the most charming postcards, designed by the wonderful cartoonist, Katie Fricas, who is also a member of the library’s events staff. 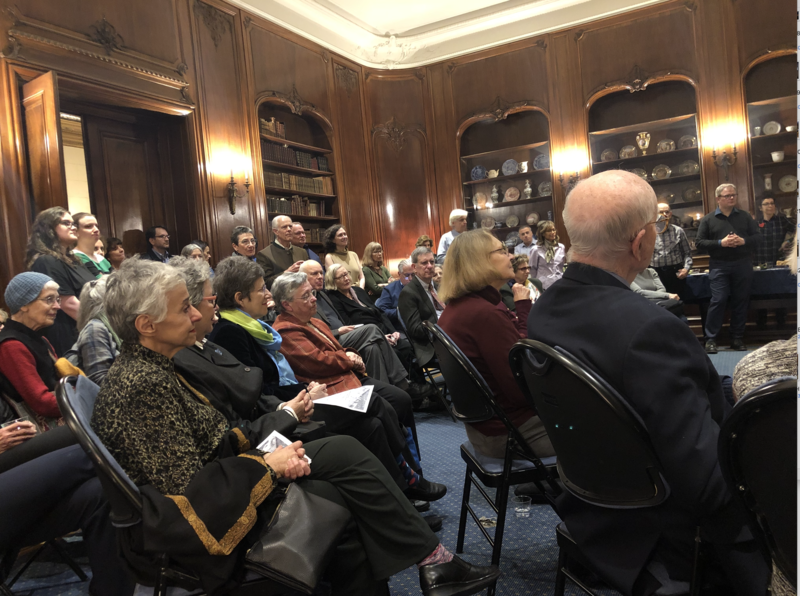 As for me, it was fun to be talking, however briefly, about the women of suffrage for a change, although I did manage to get the men into the story as well. And it was really exciting for me to see so many men in the room. Let’s imagine that we are women citizens of the United States and residents of the New York City of 1914. One hundred and four years ago. As women, the law gave us the back seat in all rights governing property, personal rights, and the custody and religious training of our children. It barred us from serving on juries, even if we own property, which was a condition at the time. Ah, but if we own property and happen to be married to men who have none, they still can serve on juries, on the strength of our property ownership. If we die and leave no will, the law entitles our husbands to everything in our estate. But if our husbands die and leave no will, the law entitles us only to a third. If one or any of our children die while we and our husbands are still alive—but the child leave no widow or widower or children of his or her own, our husband inherits all the child’s property and we—nothing. If our husbands die and leave no children, we as widows get half of their personal property with the rest allocated among his parents, siblings, nieces or nephews should they be alive at the time. But if we die in such circumstances, our husbands get everything. If we work alongside our husbands in a business or partnership of some sort, our earnings belong to our husbands. We’re entitled to nothing, including no stake in the product of our joint enterprises. We, as women, are taxed at the same rate as men, have our property confiscated for the public good the same way as men, and pay for our crimes or our violations of contracts as men do, all under punishments we had no say in determining. So, this is to say that the right to vote is not some romantic notion. Many things struck me in the airing last night of the HBO documentary by Jonathan Alter, “Deadline Artists,” about the sui generis New York journalism careers of Jimmy Breslin and Pete Hamill. Among them was this quote from a 1965 column of Breslin’s written in Selma, Alabama during a five-day civil rights march. Hearing it, my mind immediately sped back half a century to wonder if this could also be said of the women’s struggle for equal rights. Yes, but somehow the lines aren’t quite parallel, which –who really knows–perhaps helps explain the tendency for women’s rights always to be a subordinated struggle. I think Frederick Douglass, a suffragist himself, explained it best in articulating why he and his longtime friend Susan B. Anthony parted ways after the 14th Amendment passed in 1866-68 with another 50 years of struggle ahead for women. Now, from our perch in 1914, let’s think forward three years, to November of 1917, when, by state referendum, New York became the 12th of 48 states to grant women the franchise, and the first in the eastern half of the country to do so. 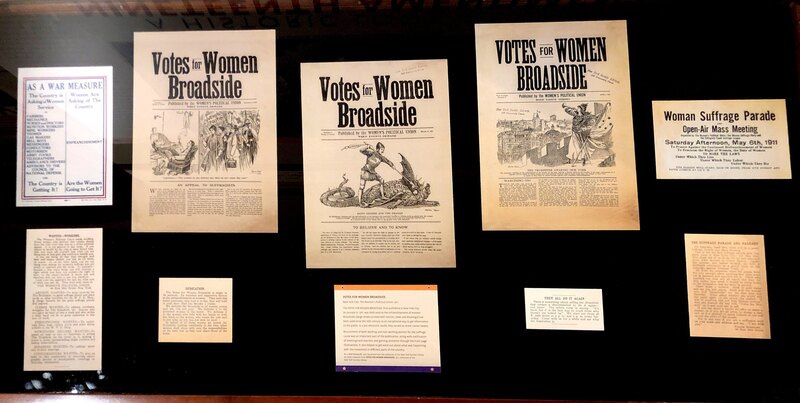 This was great for the women of New York State and just as great for the nation, because it powerfully added a 44-seat congressional delegation—a huge one–to the pro-suffrage forces in the House of Representatives. 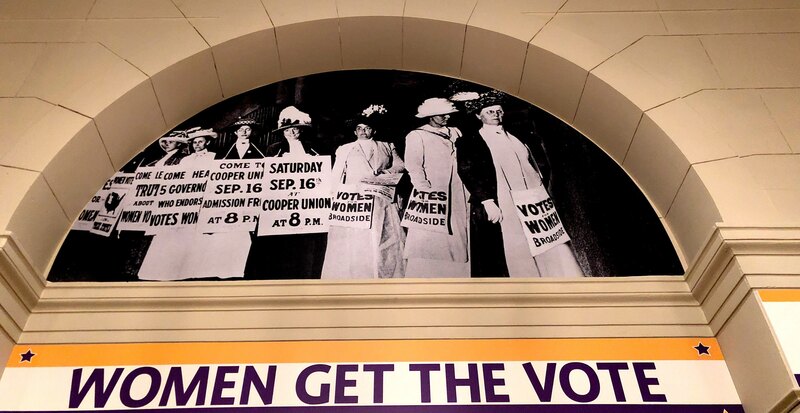 This was key to momentum-building that steam-charged the path to the 19th Amendment. Why was a change in the US Constitution so important? Because the preponderance of states—more than 30 of them at that point in 1917–had either defeated the effort in failed referenda, which in some cases would have to wait decades before being proposed again. Or, the legislatures in those states simply never brought the question to vote. Without a constitutional amendment, women in those states would have been excluded from the nation’s polity, perhaps permanently. Think about this, too: The long painfully slow march of positive social change. 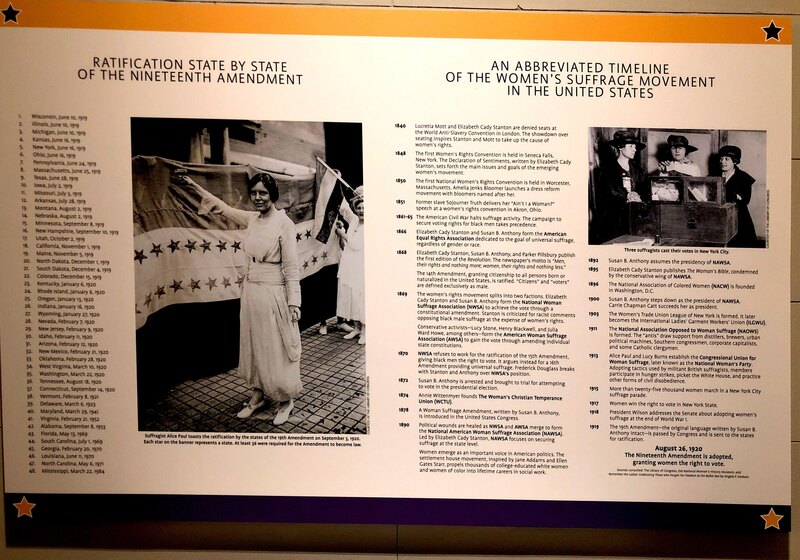 1919, the year Congress passed the 19th amendment, was seven decades after the Seneca Falls convention of 1848, which is considered the suffrage movement’s symbolic starting point. Seven decades. So, what we are really celebrating at this juncture is more than a centennial. It’s a victory that was more than 170 years in the making. Nigh on two centuries. I guess we shouldn’t feel too badly that the Equal Rights Amendment has been languishing for 99 years, since its introduction in 1920. With 70 years yet to go, no wonder we are still at the starting gate. The road is difficult now as it was then, but not for quite the same reasons. Imagine what it must have been like, being a non-voter, besieging legislators whose responsibility was to voters and voters only. And woven into the opposition were women, the antis, who clung tightly to the status quo and undercut all your good arguments. 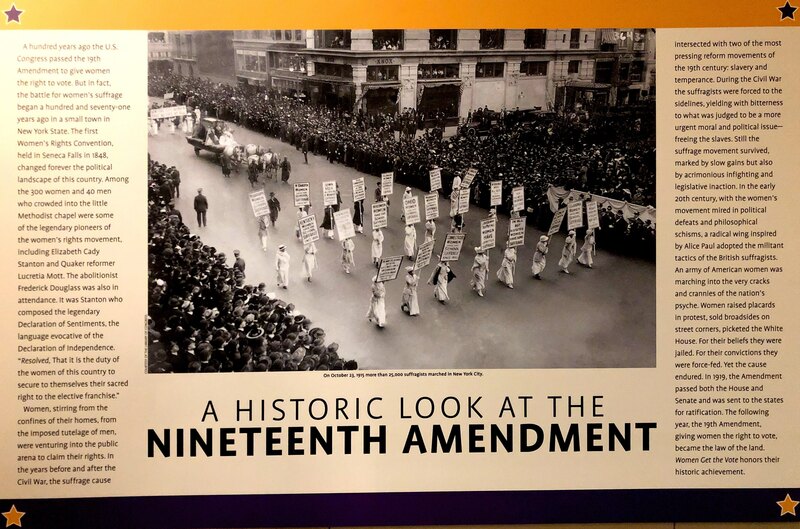 Ratification came in 1920 by the three-quarters of the states and enshrined the Nineteenth Amendment to the US Constitution into law. Scholars differ on what finally brought the measure over the finish line. The stronger pro-suffrage representation in Congress because of populous states such as New York and Michigan that came aboard in that last decade were critically important. Their support in Congress helped blunt the power of the Southern antis, who were so fearful of the advantage black voters would gain with black women on the rolls alongside black men who won the vote in the 14th Amendment. 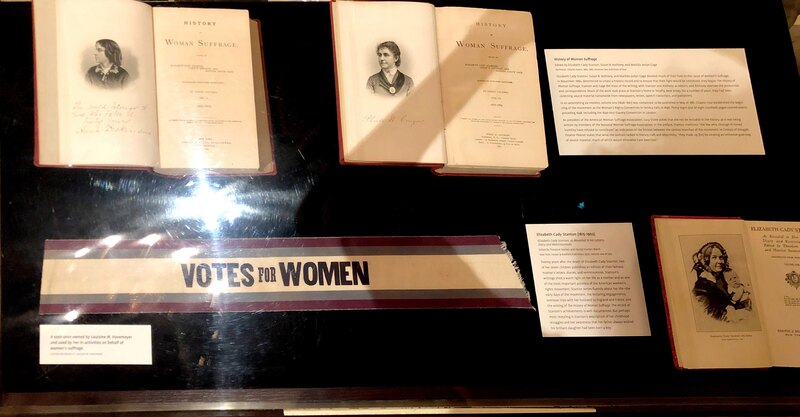 Many scholars would add that the more aggressive agitation of Alice Paul and the silent sentinels of her National Woman’s Party were a factor in that final decade. Others would say the quieter more incrementally directed tactics of Carrie Chapman Catt and the National American Woman Suffrage Association with their remarkable publicity-producing parades and pageantry, publicity-inducing stunts were key. Still others would credit World War I, the outstandingly sacrificial role women played in its victory and the way that softened Woodrow Wilson’s opposition to the federal amendment at the same time as support in Congress grew. I am quick to credit the huge influx of powerful social and professional elites who became movement worker bees and allies—both men and women– in the 1910s, the final decade of the movement. It’s when momentum really became super-charged and I believe they were a key and under-recognized factor. 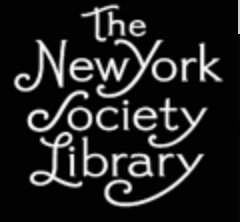 Among those in this category were many paragons of New York Society in the 1910s, including members of this library. Here’s the video, courtesy of the husband person.